J-Aircraft DotCom does NOT necessarily endorse or recommend the product. And that all commercial hotlinks to our (c) review for the purpose of advertising is expressly prohibited. Here is my review of the 18 current colors produced by White Ensign Models for Japanese WWII aircraft models. All colors were examined on a clear day between the hours of 10 AM and 2 PM. They were matched to Federal Standard 595B, some Munsell chips, and color plates in Robert Mikesh’s “Japanese Aircraft Interiors – 1940-1945”. Opinions expressed are exclusively mine and do not reflect the opinions or policies of j-aircraft.com's ownership or staff. These paints are packaged in 1/2 oz./14 milliliter tins that will be familiar to those who have previously used Humbrol paints. It has been my experience over the past 30+ years that paint in tins has long shelf life. The paint itself is a fairly viscous enamel and provides good coverage. I applied these paints with a Paasche model H airbrush set at 20 pounds psi pressure. All were thinned with lacquer thinner. Chips were made from 2 inch X 3 inch (51mm X 76mm) white styrene card of .020” thickness with a 'view port' punched in the center. I have found that placing the chip against the artifact for comparison through the port is the best way to make an accurate comparison. I would describe the finish that was rendered as 'eggshell'. That is, it falls between flat or matte and semi-gloss. Drying time was good for enamels and the finish is pretty sturdy after drying overnight. The only color that took longer to dry than the others was the Aotake. The numbers on the chips in the photos correspond to the last two numbers of White Ensign's stock numbers. I do not have enough experience with Japanese dark green artifacts to be able to comment on the manufacturer names given to each shade. In the first photo starting at left is chip 1, 'IJNAF Black-Green' ACJ01. This color is closest to the few original artifacts I have seen from the Kawanishi N1K1 and an unknown kamikaze aircraft at the Nimitz Museum of the Pacific War. It is close to FS 34084 or Tamiya's XF-11, but it has a bit more blue tint. I recommend it. 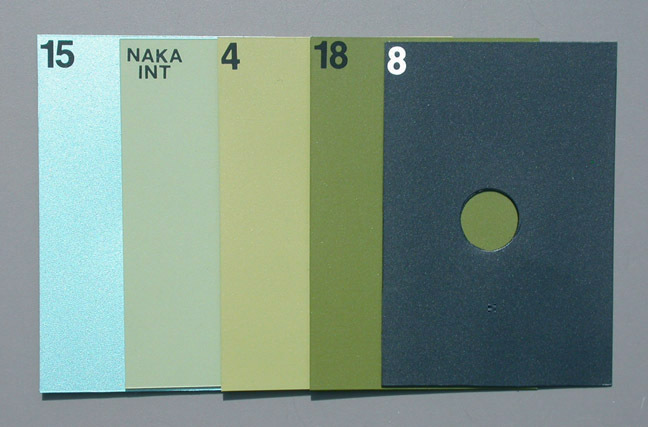 Chip 3 is 'Nakajima Navy Green' ACJ03, also a very dark green, it is close to FS 34058 but with more blue tint. I have seen a match to 34058 on a Nimitz artifact from an unknown aircraft, possibly of Kawanishi manufacture. Chip 5 is 'Nakajima Army Green' ACJ05. This is a dark green that does not have a noticeable blue, yellow or olive tint. I cannot find any FS match but it falls between 14097, which is darker, and 34074, which is brighter in tone. Chip 6 is Mitsubishi Navy Green ACJ06. It falls between FS34102 and 34092 with a bit more blue tint. It is lighter in tone than Tamiya XF 70 but darker that the old Aeromaster enamel Mitsubishi Green. Chip 9 is 'Kawasaki Army Green' ACJ 09. This is a dark green with a yellow/gray tint. Coincidentally this color falls between 34095 and 34096. Surprisingly, according to my notes, this is a match to the cockpit color of the early Nakajima-built Zero s/n 646 that was shot down on Midway. 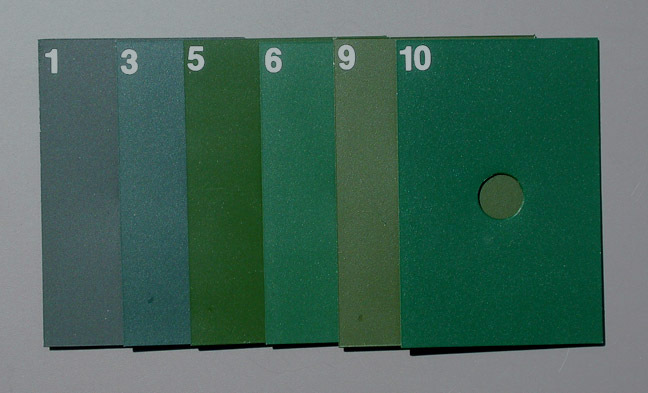 Chip 10 is 'Kawanishi Green' ACJ10. This is a blue-tinted paint similar to the color seen in many illustrations in Japanese publications over the last four decades. It is close to, but slightly darker and grayer than FS 14066. In this section I have applied a gloss clearcoat to some of the White Ensign paints and I will identify chips with that treatment. Chip 2 - 'Nakajima Navy Grey' ACJ02. A very pale green, slightly lighter and less yellow than FS 34583. Chip 12 - 'Undersurface Grey-Green' ACJ12. The upper half of this chip has been glossed. It is close to FS26357 but greener. In comparison with the chip labeled 'Kate' which is a match to the full-size color of an artifact from the underside of the B5N2 shot down at the hospital at Pearl Harbor, it is lighter and less grey. 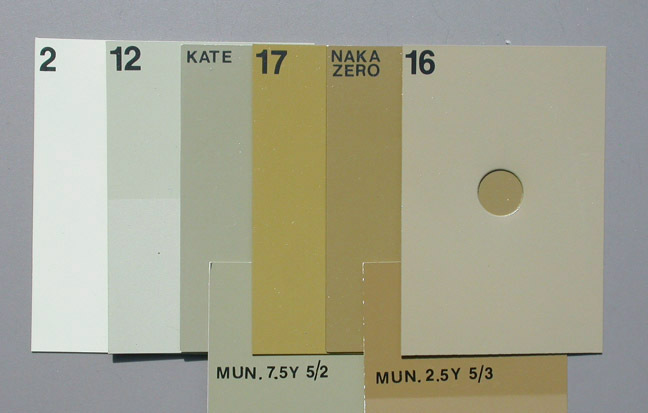 For those of you who subscribe to the theory (as I do) of 'scale effect' for low value (grey-toned) paints, this would be a good paint to use on 1/72nd scale Nakajima aircraft like Ki 27s and B5Ns. Chip 17 - 'Nakajima Amber Grey (Ame-iro)' ACJ17. White Ensign's rendition of I3 as used on early Nakjima-built Zeros as well as some Aichi 99s shot down at Pearl Harbor. I could not find any FS colors that are close. I applied a gloss clearcoat to this sample. It is lighter and more yellow than the full scale color, labeled 'Naka Zero' that I matched to an artifact from an early Nakajima-built Zero. This is a good scale-effect color for those subjects in 1/48 or smaller scales. Chip 16 - 'Mitsubishi Zero Grey-Green' ACJ16. I do not have, nor have I ever seen any artifacts from a Mitsubishi-built Zero from the period after Pearl Harbor. However Jim Lansdale does and he assisted with the development of this paint. The chip, which is has a gloss clearcoat is close to FS 16350 but with a more tan tone. This color is similar to but lighter than an artifact I have from a Nakajima-built Zero manufactured in December, 1942. I recommend this paint for any mid-war Zero 21's, 22's and 32's. Chip 15 'Aotake' ACJ15. I have been fortunate to examine many artifacts with aotake translucent phenolic lacquer applied to them. There are two definite shades usually seen; green or blue. Artifacts from the same B5N2 at Pearl Harbor show both dark green and medium blue colors. They range in application from very dark to quite bright. White Ensign's interpretation of aotake is very similar to that seen on an artifact on display at the Nimitz Museum from the G4M1 bomber in which Admiral Yamamoto met his death. Chip 18 - 'Mitsubishi Interior Green' ACJ18. Similar to 34089, but more yellow. It is slightly darker than color A31 as found in Mr. Robert Mikesh's 'Japanese Aircraft Interiors'. Chip 8 - 'Mitsubishi Cowl Blue-Black' ACJ08. A deep midnight blue close to FS 25042. I have also seen this color on wing spars of a D3A2 and the inner surface of a wing fillet from a Zero 32. Photo # 4, starting with chip 7, 'Mitsubishi Navy Grey' ACJ07 is a light grey, very close to FS 26373. ACJ 16. An interesting model of one of the abandoned Zero 32's at Buna could be made using these two paints. Chip 14 'Earth Brown' ACJ14. Darker and less yellow-toned than FS20266, lighter than Mikesh's A35. 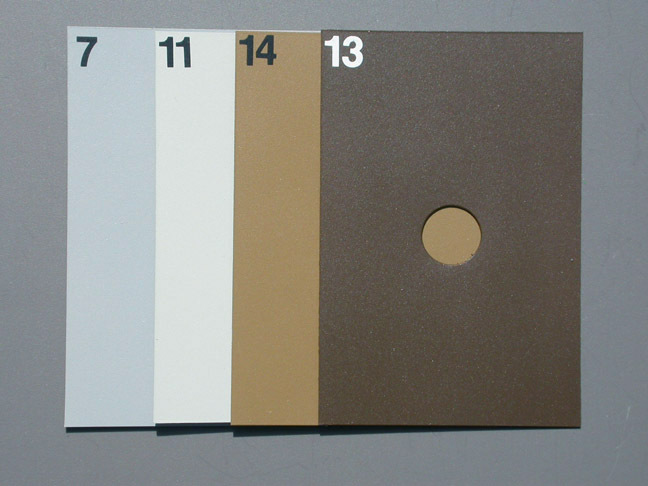 It is intended as the brown component of the kumogata scheme. It looks good to me for this use on early G4Ms. Chip 13 'Red-Brown Primer' ACJ13. This color is 'cha iro' (tea color) as used on the rear faces of early war propellors and overall on later prop blades and spinners. It is slightly lighter than FS 10080. It is not the terra cotta red used to prime IJNAF planes. I recommend it for use on props. That wraps it up. Thanks again to White Ensign for kindly providing the samples used in this review!